The Lao of Cambodia, also known as the Laotian Tai, live in the lowland regions of northern Cambodia, near the border of Laos. They are primarily located along the Mekong River and its tributaries. Their language, also called Lao, is a Lao-Phutai dialect of the Tai language family. 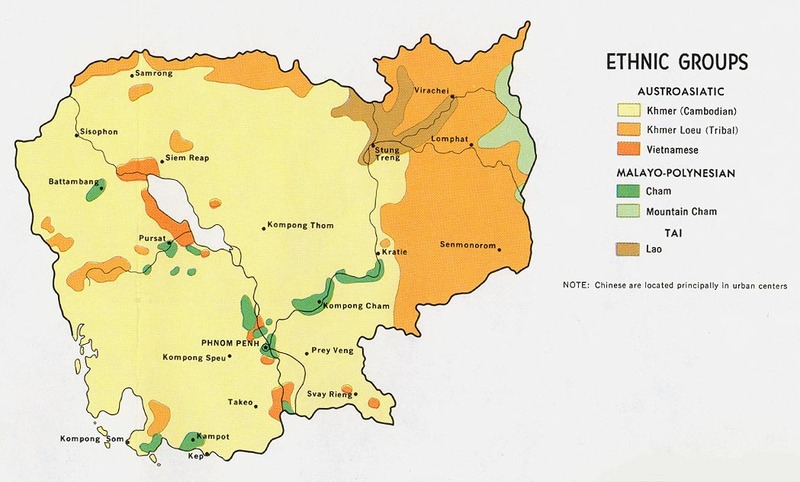 Centuries ago, the Lao lived in China. However, relentless pressure by the Chinese gradually forced them southward. When the Lao Kingdom was replaced by a Communist administration during World War II, many Lao fled to Burma, Thailand, and Laos for refuge. They made their homes along the Mekong River in the eighth or ninth century, and moved southward into Kampuchea (present-day Cambodia). A cease-fire was signed in 1991, ending 13 years of war. However, the rebel Communists known as the Khmer Rouge refused to disarm. Today, much of the land in Cambodia still contains field mines, making it unsafe for the villagers to farm. Although Cambodia's constitution does not guarantee human rights for minority ethnic groups, the Lao seem to live peaceful lives in the northern provinces. Most of them are wet-rice farmers. They also raise cotton, mulberry bushes (for silk worms), coconut palms, and various fruits. The Lao have had to become self-sufficient because of the numerous wars and threats of the Khmer Rouge. In 1975, the Communist rebels attempted to gain control of the Mekong River, but never arrived as far north as the Lao. The Lao live in villages located alongside rivers or near roads that give them access to Chinese merchants. Their villages range in size from ten to several hundred families. Lao houses are typically made of bamboo strips and palm leaves. They are built high on stilts to protect against the mud and water of the rainy season. Family livestock, which includes poultry, pigs, and goats, is allowed to run freely underneath the houses. Nearly every family raises cattle and buffaloes, and cultivation is done with wooden equipment drawn by buffalo. Some of the Lao are fishermen, and some of the farmers are also blacksmiths or carpenters when there is great need. The Buddhist Wat, or temple, is the center of village life. Village leadership is usually divided; the chief has authority in secular matters, while the Buddhist monk has authority in religious issues. Lao society no longer has rigid social classes; consequently, there is no longer a hereditary elite class. Their social structure is based on family units, with no widespread lineages or clans. The people are very closely attached to their customs. Sexual promiscuity before marriage is relatively common. The Lao have a variety of folk arts, and their specialty is a bamboo wind instrument called the khene. The women typically wear short-sleeved blouses and vertically striped pha sins (skirts) woven of cotton or silk. The men usually wear short-sleeved shirts and short trousers. The young girls adorn their arms and necks with silver or gold jewelry. More than half of the Lao combine folk animism (belief that non-living objects have spirits) with Buddhism. They seek help through various supernatural beings and objects. Of major importance to them are the territorial deities. About one-third of the Lao are Buddhist. Traditionally, young men enter village monasteries for about three months to study Buddhism. The Lao Buddhists believe that right thinking, ritual sacrifices, and self-denial will enable the soul to reach nirvana (a state of eternal bliss) at death. They live in fear of their gods and constantly strive to appease them with religious chants, rituals, and sacrifices. They also believe that existence is a continuing cycle of death and rebirth, or reincarnation. * Scripture Prayers for the Lao in Cambodia. * Ask the Lord to call people who are willing to go to Cambodia and share Christ with the Lao. * Ask God to use the small number of Lao believers to share the love of Jesus with their own people. * Pray that God will open the hearts of Cambodia's governmental leaders to the Gospel.